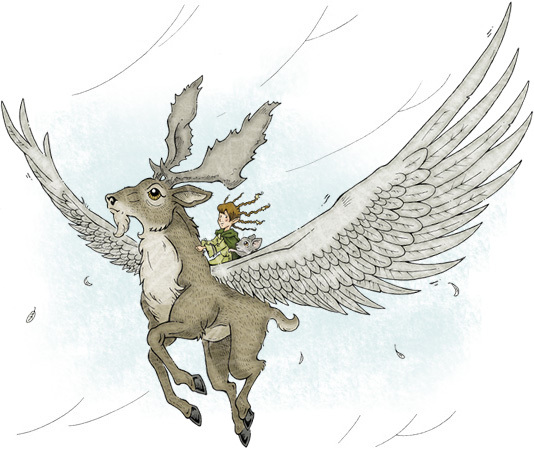 The magnificent flying deer known as perytons are strong and muscular, with large hooves and powerful eagle-like wings. They are skilled fighters, with great stamina and endurance. The males have long, curved antlers and thick beards. The older the peryton, the greater his antlers and beard. Perytons are ruled by a grand king and live in a complex society on the mysterious Mount Zephyr, a tall peak that is hidden by mist and fog. Most perytons believe they are superior to the other creatures of the world and, as such, like to keep to themselves. Outsiders are not welcomed on Mount Zephyr—though, for those without wings, visiting the realm of perytons is near impossible. If perytons do come in contact with outsiders, they never reveal their names, for these are considered to be important and magical aspects of their spirits. Perytons eat a variety of vegetation, though a favored food is the rich green moss that grows on Mount Zephyr. Kendra Kandlestar met a peryton aboard the gnome galley called the Golden Loot. This was none other than the Prince of Perytons. Kendra was struck with awe by the creature’s beauty and nobility. They were to share many adventures together. The peryton even let Kendra and her companion Honest Oki ride him—something not normally permitted.